Can someone please help me? I have an 8 inch center piece of fabric. I want to make the unfinished block to be 12 1/2. 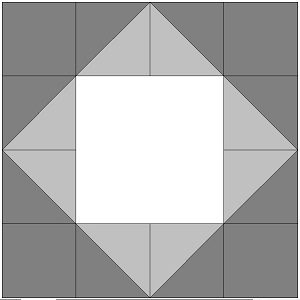 I want to sew half square triangles to the 4 sides to make a square in a square. 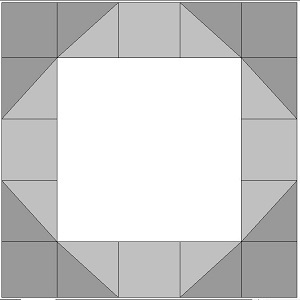 What size do I cut the squares for the half square triangles? Sorry, can't be done. For a 12" finished block that is a square in a square, the finished HST's measure 6" on each side. (Cut each from a square that is 6 7/8", or from a 7" square and then cut down the HST.) But the center square needs to be almost 8.5" finished, or 9" unfinished. Question, is the center block 8 inches finished or unfinished?? 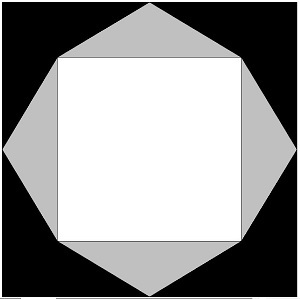 Secondly, you want the center block to be square and then the side blocks to form a diamond around it and then a square around that, right?? If that is the case, you will be working with 60 degree angles. 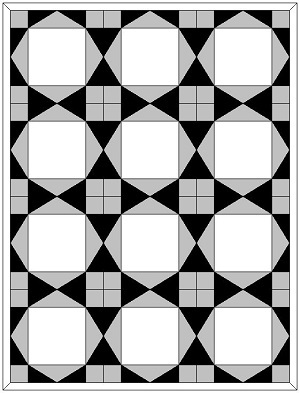 Much better to make the block 16 inches because the math becomes very simple. It would be a sawtooth star with the side pieces inverted. Last edited by GingerK; 08-09-2013 at 07:36 PM. It can be done if the center square (which I assume is 7.5", finished) "floats" in the outer triangles, which would have to be cut somewhat bigger to make up for the smallish center square. 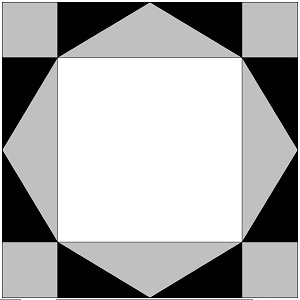 Not the conventional square in square, but attractive (and still a 'square in a square'). If I have a moment tomorrow morning, I'll try to work out how big those triangles need to be. If you have 2 co-ordinating colours, you could do churn dash. Or you could use one colour (even just black or white) and just make 2 inch sashing between each picture. If you want a "true" square in a square block (like the first pic), the finished size needs to be 15". If you want to make it with HST (like the second pic) the HST and the corner squares are 3 3/4" finished. The center square is 7 1/2" finished (so you can use your 8" pieces). In the first one the corner squares are 2 1/4" and the 3 center pieces are 2 1/4" X 2 1/2" finished. In the second & third ones, the corner squares are 2 1/4" and the elongated flying geese are 7 1/2" X 2 1/4" finished. Hope these help! Good luck and show us pics!! The post from Cherisews just proves once again that we have some very smart and experienced quilters on this board. Thanks for giving some great and easy to follow solutions for this "problem". Sustraley, have fun playing with all the ideas you've been given. Let us know what you decide on!